My mother did a double-take when she saw this goldfish bowl in my kitchen. I had just finished making this craft and set the fish bowl on the windowsill, where the sunlight streamed through, highlighting the fish and the seashells in a most realistic fashion. Mom had to look twice before she realized the fish were fake! If you prefer, you can make this craft as a seascape air freshener, using fancy seashells as the main feature, rather than the artificial fish. are commonly sold at garden centers or craft stores, and are usually used for floral displays, water retention in gardening, or to make cooling neck ties. 1. Wash and dry the glass bowl, then add water from a measuring cup, up to the neck of the bowl. Make a note of the amount of water that was used. 2. Add a few drops of food coloring, if desired. 3. If you are using oil-based fragrance or essential oil, add one drop of dishwashing liquid per cup of water, then add one teaspoon of fragrance oil, or 10 to 12 drops of essential oil and stir well. Add more scent, if desired, until the aroma is as strong as you would like it. Water-based scent can be added to the water without adding any dishwashing liquid. 4. Add one teaspoon of crystals per cup of water, stir well, and wait about an hour for the crystals to fully absorb the water. The gel should be clear and fairly firm. 5. Add seashells to the bowl, pushing them down to the bottom with a teaspoon. 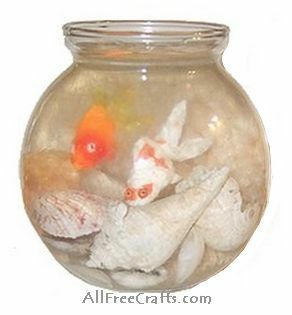 Once the shells are arranged in a pleasing fashion, add one or two artificial goldfish. 6. Set the smelly jelly fish bowl on a desk, in a bathroom, or on a windowsill, where the scent, as well as the goldfish, can be enjoyed by all. Over time, the water and scent will evaporate a little. Simply add a little more water and a few more drops of your fragrance to refresh.